As it turns out, the rigging hardware are not your typical eyebolts. 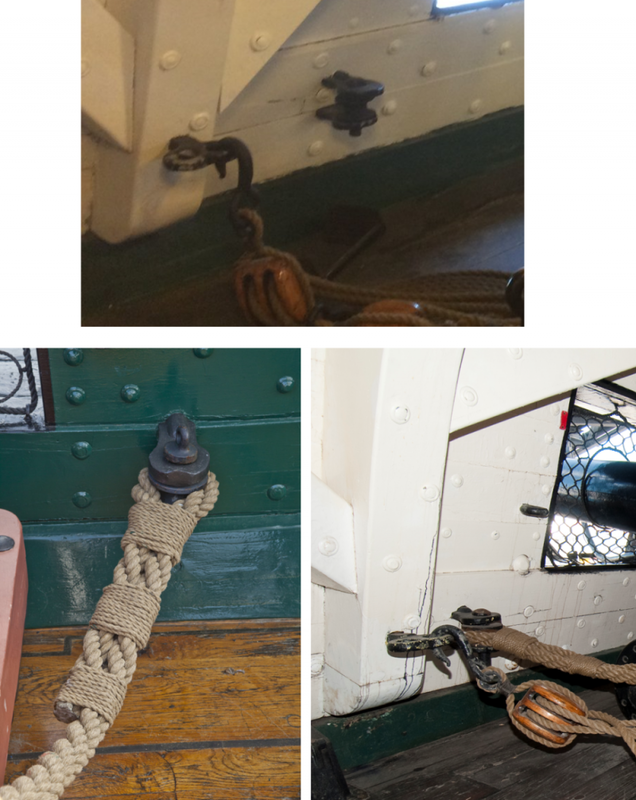 The side tackle of the gun hooks into a double eyebolt while the breeching tackle connects to two rings, one over the other, on the bulwarks using, such a seized loop of thick rope fits between the two rings and is held in place via a pin which drops through the top ring, through the loop of rope, and finally through the bottom ring. It appears the pin has a cap which prevents the pin from dropping all the way through. I took it as a challenge to create the double eyebolt, but it really wasn’t too difficult. Using 1/16” eyebolts, I bent the loop such that two eyebolt could lie next to each other without any overlap. 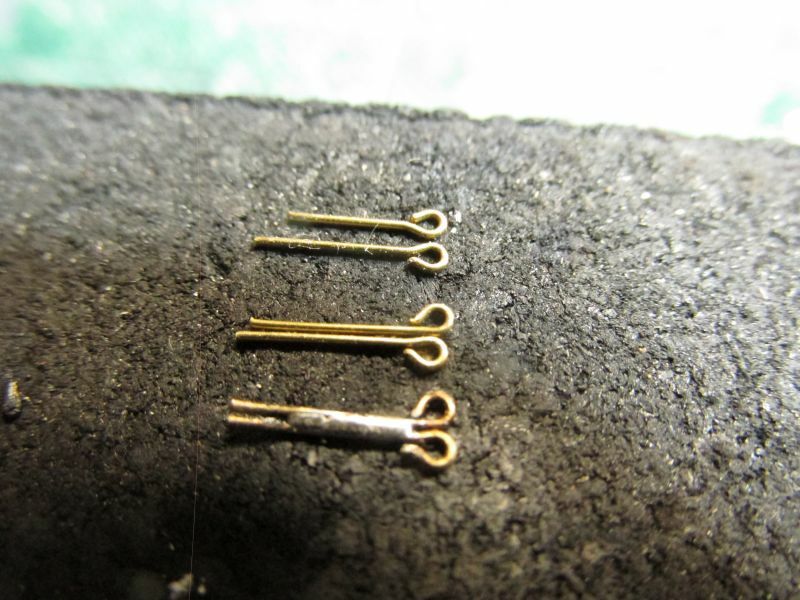 These were placed into a slightly modified clothes pin used as a clamp and silver soldered together. I tried using silver solder paste but due to the small and rounded surface area, I could get the paste to stick where I wanted it or well enough. 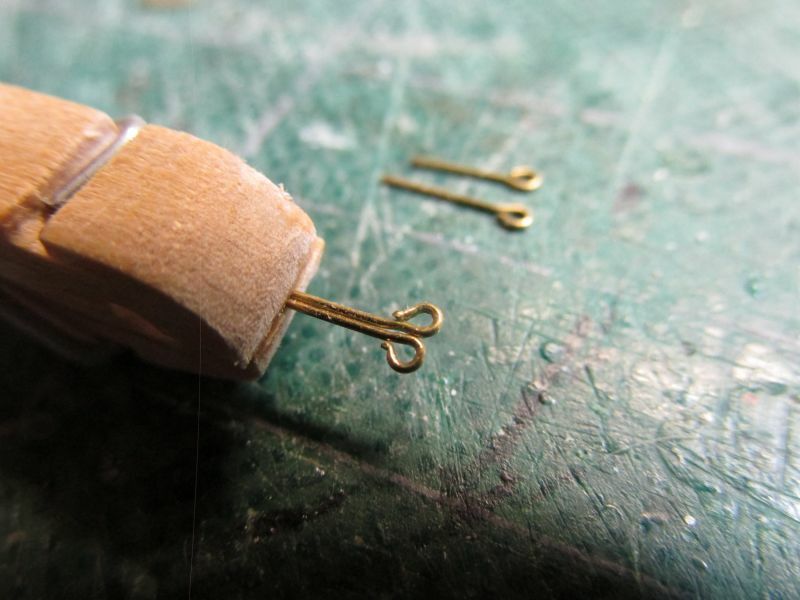 So, I resorted to using flux and a very thin sliver of silver solder from a roll. That worked great. After some filing, trimming, and blackening, I inserted the double eyebolt into the vertical knee. I decided to take the simple route for the breeching hardware and just used two 1/16” eyebolts. 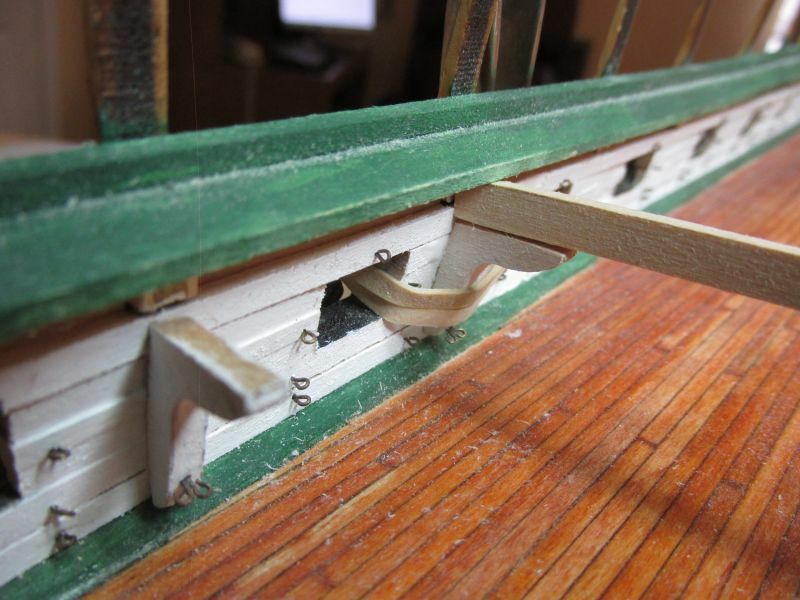 The hard part about this was drilling the holes into the bulkhead. Used tenacity and force of will to do that. That was proof of concept. Now I must do all of this again twice per gun port. Joy. Way to go on the double eye bolt. Thanks for the info and pic share. I’ve finally completed installing 154 eyebolts for the gun ports. I had to drill 7 holes per gun port using a push type hand drill: 2 sets of two for the breaching rigging, one eye bolt on either side of the gun port opening, one centered above the gun port opening. All, but the top vertical eyebolt, are orientated horizontally. The 1/16” eyebolts were pre-blackened, trimmed to size, and inserted into the drilled holes. I’ve now started to construct, position, and install the remaining hanging knees. So are you done singing 154 eye-bolts on the wall, 153 eye-bolts on the wall and so on. Now that it's done let us say it looks good. Way to hang in there and get them all done. 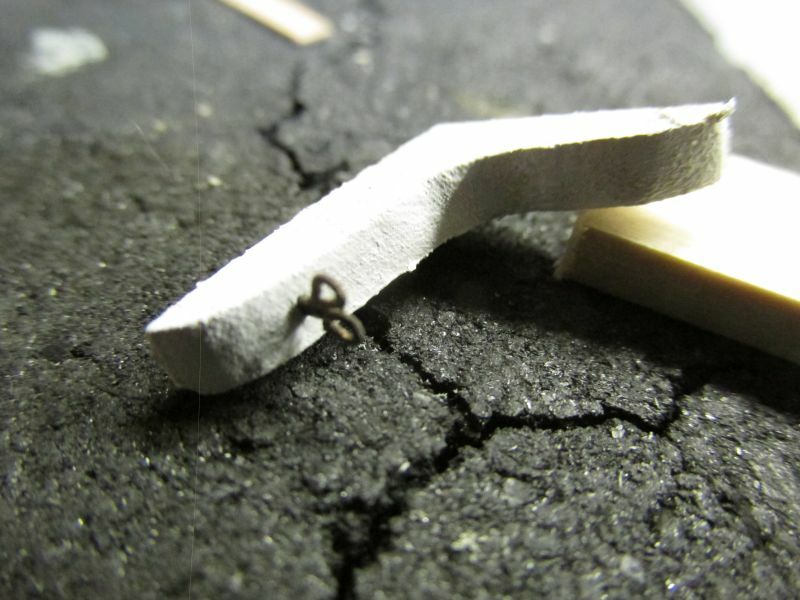 You now need to find a nice simple task or two to do before you rig the guns! Arthur - The guns are actually a ways off. 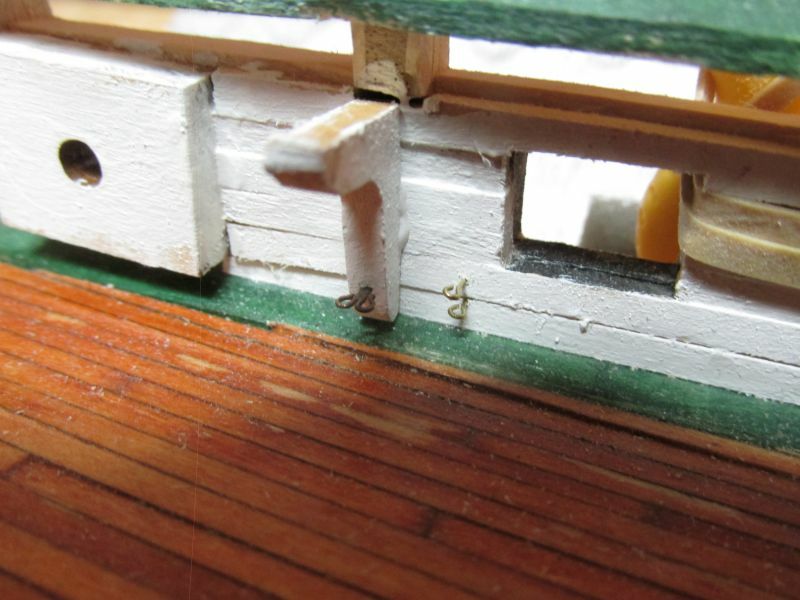 There are a bunch of things that I will be doing before I get to those: the quarter galleys, transom, and as a minimum, planking the hull along the gun deck gun ports. Presently, I just wanted to prepare the gun deck for its furniture (guns, pumps, etc.) now when its easiest to access. 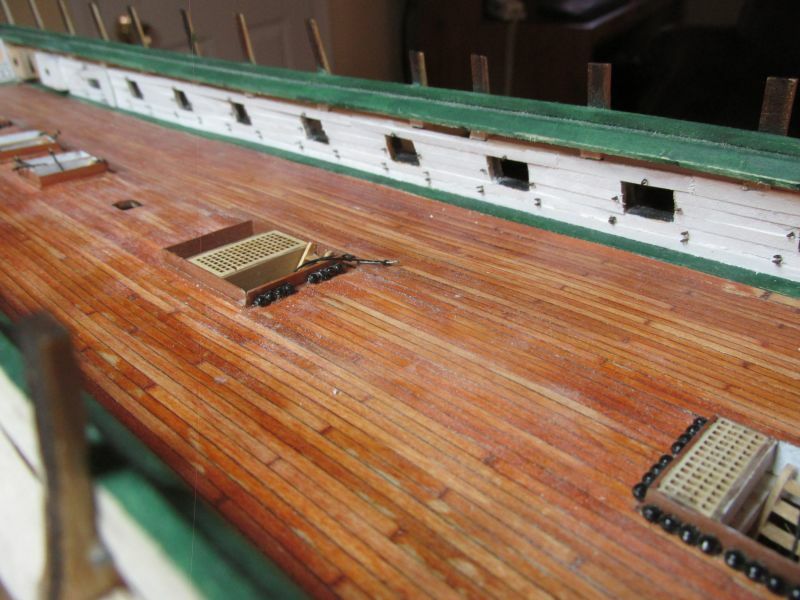 The hull is going to be man-handled (relatively speaking) during the planking and coppering stages and I don't want the delicate fixtures of the gun deck furniture get mangled like the ladder stanchions did.